Russia will need to spend $938 million (33 billion rubles) to mitigate the negative effects of its broken partnerships with Ukrainian military-industrial enterprises, its Federal Space Agency has calculated. The business newspaper Kommersant has reported the findings of a special working group of the Russian Federal Space Agency (Roscosmos), which has quantified the costs of ceased collaboration with Ukrainian military-industrial enterprises. Roscosmos has calculated that it will require $938 million (from 2014 to 2018, with $100.6 million already paid out) in order to free Russia from direct dependence on Ukrainian components and raw materials, while establishing domestic assemblies and production systems. In mid-June of this year, Ukrainian President Petro Poroshenko forbade all cooperation between Russia and his country's military-industrial complex. Russian Deputy Prime Minister Dmitry Rogozin responded by promising that a plan of import substitution for armaments was already prepared. However, until recently the costs of that plan - and the amount of work required for its implementation - remained unannounced. According to experts, Russian enterprises will have to recall the industrial practices of the Soviet Union. “In the USSR there was a system of so-called 'substitutes.' If one manufacturer increased output, another would let production tail off. Defence firms were of two types: base enterprises and accessory industries,” Professor Alexei Skopin, chairman of the Department of Regional Economy and Economic Geography at the Higher School of Economics, told RIR. “This system was meant to create stability while preventing redundancy and overproduction,” he said. Currently, however, Russia simply lacks similar enterprises that could supply components for domestic missiles, or their counterpart manufacturers have been closed down. “Everything was built on the soundness of economic ties between these two countries, and no one suspected that all this could happen,” Skopin said. Ukrainian production accounts for around 4.4 percent of Russian military imports, according to the British Royal United Services Institute. However, about 30 percent of these imports are key components for the SS-18 ICBM. “Kiev and Moscow took many steps to ensure that their mutually beneficial collaboration would remain unspoiled. 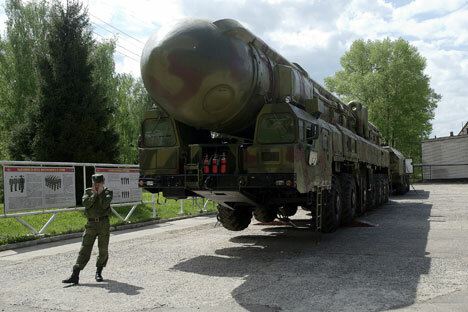 For Russia, the loss of maintenance for the SS-18 Satan and SS-25 ICBM is especially critical,” Director of the Institute of Strategic Analysis Alexander Konovalov told RIR. According to him, the missiles are designed and produced by Russian manufacturers, but their guidance systems are made in Kharkov, 470 kilometers from Kiev. Moreover, the missiles undergo maintenance service at Ukraine's Yuzhmash Factory in Dnepropetrovsk (300 miles from Kiev). “The Ukrainian factory’s service teams carried out technical examinations of Russian rockets on a regular basis,” Konovalov said. Furthermore, Russian defence enterprises have been working on the design for a new heavy liquid-fueled rocket, slated to replace the SS-18 Satan. “At first they proposed to develop the new missile jointly with Ukraine. It would have been much simpler to work together and order one of the rocket's stages from Kharkov. But now everything will have to be handled independently,” said Konovalov.